Here's a look at seven early concept designs for Valve's Left 4 Dead, posters that blur the line between the 2008 original game for PC and Xbox 360, and Left 4 Dead 2, released one year later. Seen at a Valve game artist's online portfolio, they feature environments familiar to Left 4 Dead 2 players, like dank southern motels and trailer parks. 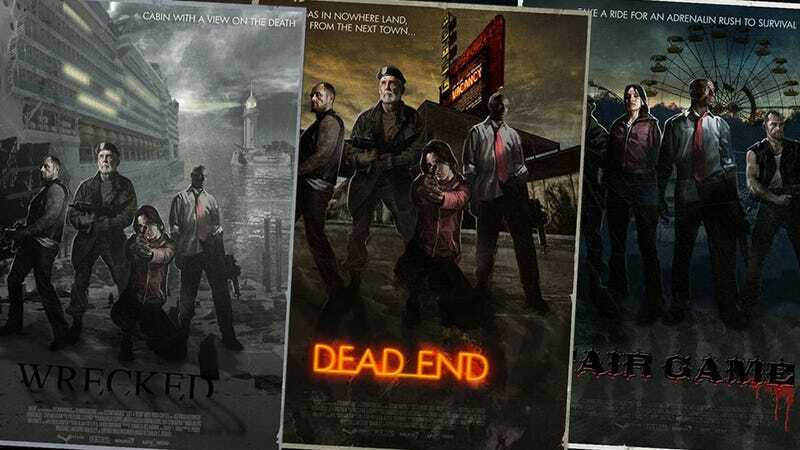 Other poster concepts feature looks at the sequel's swamp and amusement park levels, but each poster stars the original Left 4 Dead cast of Louis, Zoey, Francis and Bill. Obviously, those four were replaced by a new group of Survivors, but many of these concepts lived to see the sequel. Perhaps the most interesting of the group is "Wrecked," which shows a rotting cruise ship and lighthouse. Maybe Valve will revisit that level in a future downloadable map. Click on the "EXPAND" button in the bottom right corner of each gallery image to see a poster at its full size. "Dead End," looks like an early take on the level that would become Left 4 Dead 2's "Dark Carnival," with its memorable motel and outdoor wooded setting. Left 4 Dead "Drive In Hell" looks like the opening to Left 4 Dead 2's "Dark Carnival" campaign, with hints of Whispering Oaks. Left 4 Dead "Fair Game" would eventually become the popular "Dark Carnival" chapter in Left 4 Dead 2. Left 4 Dead "Ghost City" looks to feature the flooded waters of the sequel's "Hard Rain." Left 4 Dead "Line of Fire" appears to feature the trailer parks featured in Left 4 Dead 2. Left 4 Dead "Wrecked" offers a tantalizing look at a destroyed cruise liner, an area we've not yet explored in the universe. Left 4 Dead "Dead March" looks like the beginnings of the Left 4 Dead 2's "Swamp Fever" campaign.